Curtain Wall System Panels are an out of the box template panel for Revits Curtain walls or Curtain Systems. They should not be confused with Curtain Panel .rfa files, as thought they are ideally intended to act like regular curtain panels sometimes they do better and sometimes not so good. From the out of the box Revit Template, create a shopfront curtain wall. Select one of the glass panels and change it to a door panel. Now flip the door from right to left (edited 13-11-08 after post for clarification), using one of the flip options. Now change the door back to the System glazed panel. Notice how the panel is on the wrong side (i.e. not the same side as the other system glazed panels). As it’s a system panel it does not have the flip option. Unless someone can tell me otherwise the only way to fix this is to change it back to the door, then flip it to the doors home position, and then change the door to the system glazed panel. 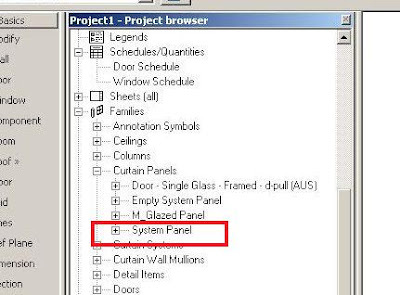 This problem appears to be in Revit 2008 and 2009 to curtent RAC 2009 - 20080915_2100 (WU2). Some other information on System Panels in my next post. I'm running RAC2009 x64 (20080915_2100(x64))and cannot reproduce the behavior you're seeing. I've just tested it again. My home computer is Revit 32 Bit but I'm sure it should act the same. It happens when you flip the door from a left swing to a right swing or vice versa (sorry I realise my post is confusing). It happens on the older version of Revit also. Try it and get back to me. I haven’t personally tested this exact same situation on Revit 64, but I would be surprised if it acts differently. I’ll look at it tomorrow. Hey Brian, nice find! I can reproduce this behavior now. It's the left-right flip that's causing the issue. It's unintuitive as you'd expect a top-bottom flip to cause such a problem! Go figure :) Guess everything needs to be centered to avoid such problems. What's more peculiar is that if you pin the panel so that it goes back to what is defined in the curtainwall definition, it still doesn't recover it's proper position.